Robert Lloyd Schellenberg, 36, had earlier been sentenced to 15 years in prison. A Chinese court sentenced a Canadian man to death on drug trafficking charges on Monday after his previous 15-year prison sentence was deemed too lenient, a ruling that has deepened a diplomatic rift between Ottawa and Beijing. Robert Lloyd Schellenberg, 36, nodded as the judge in the northeast city of Dalian asked him whether he understood the verdict, following a day-long retrial in which he declared his innocence. He can appeal against the sentence in an upper court. The sentence comes against the backdrop of the Chinese government’s anger over the arrest in Canada of a top executive from telecom giant Huawei last month on a US extradition request related to Iran sanctions violations. Chinese authorities later detained two Canadian nationals — a former diplomat and a business consultant — on suspicion of endangering national security, a move seen as retaliation over the Huawei executive’s arrest. “I am not a drug smuggler. I came to China as a tourist,” Schellenberg, said in his final statement before the sentence was announced. The Dalian court said Schellenberg, who was detained in December 2014, played a “key part” in an international drug trafficking syndicate. “The court completely rejects the accused person’s explanation and defence because it is completely at odds with the facts,” the chief judge said in a courtroom packed with observers — among them Canadian embassy officials and three foreign reporters, including one from AFP. “This syndicate… does not just spread drugs in one country, the problem has spread across borders… it is a harm to human health and also to the stability of countries,” the court said. Canadian Prime Minister Justin Trudeau on Monday expressed “extreme concern” that China had “chosen to arbitrarily” apply the death penalty in Schellenberg’s case. “Many factors in this case raise serious questions of concern: particularly, that the retrial was rushed through so quickly and that state-run media drew such deliberate attention to the case,” William Nee, China researcher at Amnesty International, told AFP. Beijing has repeatedly denied any links to Canada’s arrest of the Huawei executive. The Chinese foreign ministry said Friday critics “can stop recklessly suspecting others of politicising legal issues just because they have done so”. The Dalian court was filled with about 70 observers, who were patted down and made to empty pockets — receipts and stray coins were to be left at the security check. 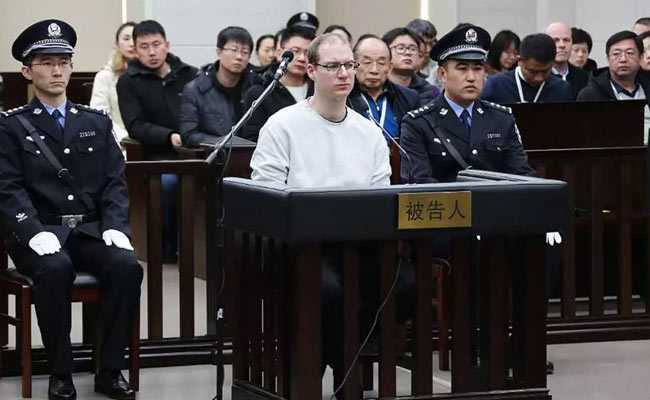 “This is a case about about a man named King (Xu Qing), he is an international drug smuggler and a liar,” Schellenberg told the court, accusing Xu of setting him up. Two other Chinese men have been involved in this case — one was sentenced to life imprisonment, another handed a suspended death sentence.